Construction has commenced on the dual tower second stage of the Aura Apartments development, with nearly half of the 64 apartments on offer already sold. The second stage comprises two absolute lakefront towers, to be developed by Gold Coast based Alder Developments and constructed by sister company Alder Constructions. "Investors often look to capital city markets for a solid yield but Varsity Lakes' yield of 5.5 per cent tops the average yield for Brisbane (4.8 per cent), Melbourne (4.1 per cent) and Sydney (3.8 per cent). Alder Developments Managing Director Greg Alder said, reflecting on the sales success. 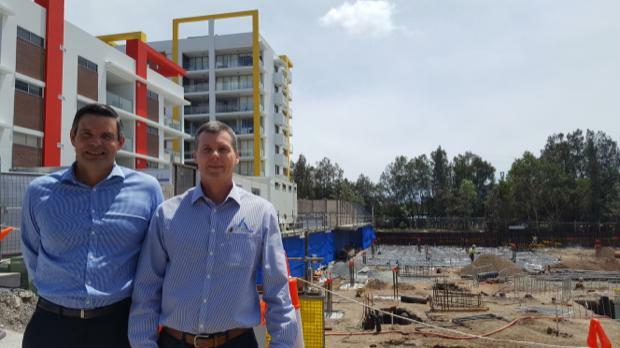 Mr Alder believes local and interstate investor interest is increasing in the Varsity Lakes region, and the new Aura Apartments have been able to feed off this interest. A recent report by Urbis supports Alder's beliefs, showing that Varsity Lakes has a higher rental yield than most capital city regions. "It even trumps the wider Gold Coast market, which has an average yield of 5.3 per cent," Alder said. 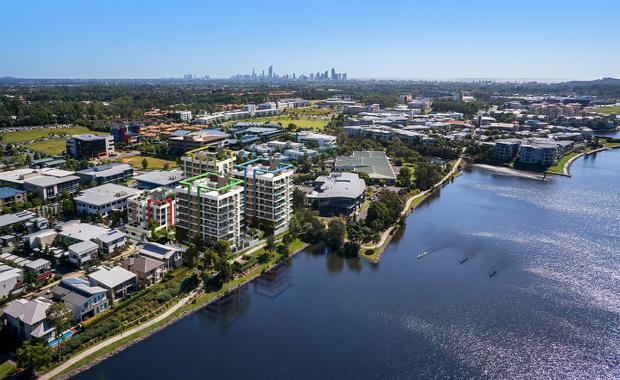 "The current Gold Coast vacancy rate of just 1.4 per cent is the city's lowest in five years, with Varsity Lakes again ahead of the field with a vacancy rate of just 0.7 per cent, due to its position as a major employment, education and lifestyle hub. Colliers sales executive Will White and Alder director Greg Alder on site. "Residents feel like they are on holiday every day with exclusive access to two pools, an outdoor spa, a gymnasium, sauna and teppanyaki grill. It's quite unique to have all of these facilities in a boutique development of just 120 apartments," he said. Aura has been designed to provide what it refers to as a 'boutique residential experience', with each floor consisting of only four 4 apartments. views are maximised and every room has natural light and captures the ocean breeze. Aura’s serene lakefront location provides stunning vistas to Burleigh heads, the Gold Coast hinterland and across the villages of Varsity Lakes itself to the highrises of Broadbeach beyond. There is also an expansive rooftop terrace atop each building, which provides vistas across Lake Orr to the hinterland, city skyline and ocean. 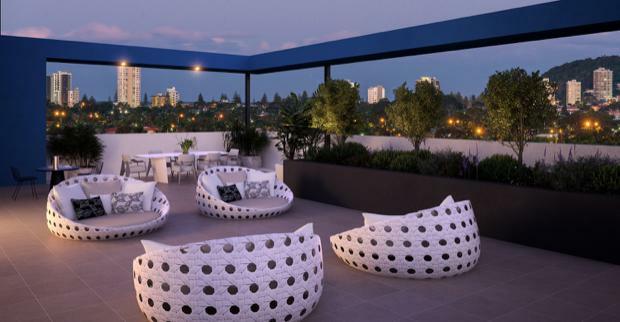 The rooftop terrace is an additional outdoor entertainment space for residents, who can also enjoy large private balconies of up to 37 square metres adjoining the bedroom and living areas of their apartment. “Every apartment in stage two is beautifully appointed with stacked sliding doors which are fully retractable leading onto the balcony, timber-look flooring to the living areas and stone benchtops in the kitchen, complete with quality stainless steel appliances. ""Aura Apartments is positioned at the heart of the Gold Coast and at the centre of the Varsity Lakes CBD, which is a highly desirable location with a smorgasbord of lifestyle and education amenities nearby, including Robina Town Centre, three schools, Bond University and numerous restaurants, parks and cafes just a short walk away," he said. "I know a number of purchasers have also chosen this area because it is still close to the beach and importantly it is within easy reach of Gold Coast Airport, which makes it easier for those who have family interstate or regularly travel for work. “Our purchasers to date have been a mix of investors, young professionals, young families and downsizers looking for a spacious apartment with plenty of natural light. A mix of two and three bedroom floorplans, ranging up to 154 square metres are available priced from $399,000 in stage two, along with just a few apartments remaining in stage one which are complete and ready to move in to. Construction of the new Aura stage two is expected to be completed by late 2017.